I recently wrote about the so-called urban/rural divide, and the relative invisibility (or unsightliness) of rural/production to urban eyes. An end-of-summer drive up Vancouver Island reminded me that there's another kind of rural divide in BC these days. This divide, unfortunately, isn't going to be remedied by our new-found foodism and the kind of "change your mind" approaches I suggested in my earlier article. the capacity for communities to re-imagine their futures. Most rural areas in the province are hurting because of bad commodity markets. Every industry that once employed many workers now puts more money into the efficiencies of machinery. But some rural and small town areas have maintained jobs (even if siginficantly lower-paying) and economic activity because they're within reasonable commuting distance from urban centres OR because they are so attractive (climate, geography, environmental features generally) that people will invest the place even if it's not so easy to get to. I live in the Comox Valley. This used to be a forest industry community. Today, with the exception of Mike Hamilton's shop on the Dyke Road, and few pickup trucks around town, the industry is invisible. What's driving our economy today is our beautiful vistas, our pleasant and safe residential areas, recreational amenities and services that make us a retirement and tourism destination. It helps that the local airstrip is big and that WestJet has regular flights. The Comox Valley isn't alone on the Island: from Tofino to Qualicum Beach, from Campbell River to Cobble Hill – "pretty" places are experiencing the dynamic: urban folk with enough cash or equity (and time to travel) to invest in "nice" places to visit or live, without necessarily having to worry about making a living in these places. As I drove out of Campbell River, however, things got a lot less pretty. I've been visiting Sayward since the late 70s. The recently completed road through to Port Hardy had meant that Kelsey Bay was no longer the southern terminus for the Prince Rupert. That was a relatively small setback: the town still hosted a couple of very big logging operations; people were building big houses; they were still clearing land and investing in farming; the commercial fishery was still thriving. In the late 70s the Sayward Valley was intimate, beautiful, prosperous. By some it was seen as a kind "Comox Valley North." Wetter, but agricultural, with a strong forest industry foundation. It was a place with a sense of future. 30 years haven't treated Sayward - or the rest of the north Island - very kindly. The forest industry jobs are largely gone, along with the most accessible and profitable big stands of first growth timber. The fishing industry is in the tank. People have, by and large, been pulling their investments out of the region. This became even more evident as we drove north. The 95km Nimpkish Valley is the "largest watershed on Vancouver Island." It still boasts a logging railway, but 30 years ago the Nimpkish Valley was also home to a handful of large logging camps, with attendant communities tacked on to them: Woss, Vernon, and Nimpkish. Of the three, Woss still retains some presence. It's still a small town surrounded by the forest. But the industry doesn't need men the way it once did (it'll be another 25-50 years before the 2nd growth is harvested), and so young families aren't attracted to the place. The Woss school only just made the minimum number of students to stay open this coming year. As for Vernon and Nimpkish, over the years they've shrunk to chainlink compounds with an office and machine shops and a fleet of pickup trucks at the centre. Further north, Port McNeill still hosts two "motor hotels," a handful of restaurants, a clutch of retail and commercial outlets. There is still enough logging going on that at least one house was being built in the local subdivision. Evidently it remains a place with enough frontier energy and enough promise that some people are prepared to sink roots. But that bit of hopefulness evaporated as I drove into Port Hardy. 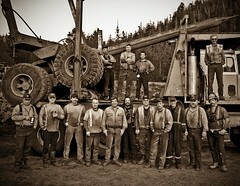 With the end of mining and the shift in the fishing industry, Port Hardy has been hit very hard. The waterfront I knew as thriving was now derelict. It was hard to imagine the distance between this harbour and the one's I'd only just left in Campbell River and Comox. The north Island wasn't without it's bright spots. We did take in the reinvention of picturesque Telegraph Cove, from logging and fishing post to eco-tourist destination. Surprisingly, a similar bright spot met us in Zeballos at the end of a long and rough logging road. It was a sunny day, not a cloud was in the sky... it's hard not to enjoy Zeballos' fjord-like setting, and it's streets and buildings dating from the 1930s. Fishing, mining, logging – once its reason for being, were being replaced by the promise of a new kind of tourism. The owners of the recently burned Zeballos Hotel were even re-investing, building a the new and imposing Post and Beam Lodge. While we ate some of the best ceviche I've tasted, a staffperson suggested that Zeballos was going to be "the next Tofino." Does Zeballos have the kind of transportation linkages that even a relatively remote place like Tofino offers, ie. a paved road, needed to be that much of a draw? I don't know. What I do know is that that someone in Zeballos, like some folks in Telegraph Cove, has identified a new natural resource: it can capitalize on it's environment and its picturesque setting, and perhaps enjoy some limited kind of amenity migration - even if that's only of the short term tourist variety, to sustain itself. And having said that, it seems there's another rural divide. Not just between those communities that are part of the current amenity migration/tourism economy (on Vancouver Island, communities south of Campbell River on the east coast and Tofino on the west coast), but between those that are already re-imagining themselves as part of a post-resource-extraction economy and those that are still firmly inside the remnant coastal forest industry. The trees and ocean are what bring us our wealth in our coastal communities. For the post-extraction communities, the wealth now comes from hosting visitors or attracting new residents, investors, and retirees who come to see the trees still standing, the whales and fishes still swimming - or caught and released to swim again. It's a different way of looking at the woods we live in. Tim Pringle has been working with stewardship and conservation groups for over 20 years, through is work at the Real Estate Foundation of BC. This article draws observations from Tim's experiences, and focuses on those organizations and collaborations whose work influences policy makers and planning processes at the regional and local levels. As Tim says, "This critical work helps the public, governments, land owners and developers to appreciate the relationships among green infrastructure, ecological health and community well being." The wealth and well-being of communities is tied to the land and surrounding ecology. It should be no surprise that that 30% of the current statues (164 of 538 acts, not counting attached regulations and schedules) comprising BC Law substantially address these resources. This reality describes the commons values of BC residents in the lands of the province. Having credible stewardship and conservation expertise available to measure the condition of ecological and environmental values in the local government context as well as more widely, supports holistic approaches to planning for use and conservation of lands. This intelligence exposes the weaknesses of historic land use strategies, which tended to discount the value of natural capital. The stewardship and conservation (S&C) sector in British Columbia is known for its strong roots in advocacy – the birthplace of Greenpeace, conservation in the Carmanah Valley, and the recent success of the Rainforest Solutions Project. This results of this work protects some of BC’s unique and ancient ecological systems. The sector also comprises another leading group of organizations that have proven their beneficial capacity to influence management of settlement change in the province. These S&C practitioners work in the local, regional and senior government contexts. Their research, mapping, public and professional education, as well as other services wisely support policy and planning to address ecological diversity concerns. In the last 20 years these organizations have become, in several regions, the primary source of expertise about regional and local ecological assets. What has supported this trend and what guidance about successful practices might be observed? One reason the S&C sector’s expertise gains recognition is the commitment of conservancies and stewardship organizations to their values. As non-profit, usually charitable societies, their constitutions declare their primary values as does the history of their work. Their missions align with protection of public trust values concerning stewardship and conservation – subjects that often are on the minds of communities. There are a growing number of successful projects, among many. For instance, Darkwoods at Kootenay lake, the “largest single private conservation project in Canada” (see Kingfisher, Vol. 18), was realized by national heavy weight, the Nature Conservancy (BC) and regional collaborators working with an owner favouring conservation of bio-diversity. A second defining characteristic of the sector’s expertise stems from the collaborations and networks that these organizations often build to carry out their work. Among the most influential regional groupings are organizations such as the South Okanagan Similkameen Conservation Program, the Grasslands Conservation Council of BC, the Okanagan Collaborative Conservation Program, and provincially, the Land Trust Alliance of BC among others which provide educational, leadership, convening, and research services. These alliances can produce powerful results as evidenced by the role of the East Kootenay Conservation Program when it spearheaded the initiative that resulted in the Columbia Valley becoming the first community in Canada to adopt a “comprehensive conservation fund tax” (Dec. 2008). BC’s largest membership conservation organization, The Land Conservancy, collaborates widely and constantly pursues innovation. Currently TLC is exploring the use of numerous financial incentives to encourage community agriculture. These commitments to mission and successful forging of multi-partner initiatives with innovative strategies make the regional collaborations unique. Their qualities have attracted a constellation of funders. Federal and provincial ministry programs, foundations based in BC and elsewhere, local governments and businesses have provided financial support. Very importantly, the funding has been accessible over a number of years, although the amounts rarely have been enough to keep up with the growing need. Over the years funders have conferred occasionally about the importance of the work carried out by the regional collaborations. The repeated funding commitments confirm that the funders have valued the services delivered. These groupings focus on regional biodiversity and work with all relevant land practitioners to fulfill their mandates. The Real Estate Foundation has funded six S&C collaborations, some for several years, to support their development and services for regional communities. This long-term involvement has made clear a third key strength that they have. Like most of their colleagues in the S&C sector, the regional collaborations focus on outcomes. This is the performance-based bias and it can be a very effective fit in the local government context. . In contrast, local government agencies carry out their operations with a “regulatory bias,” which stems in part from specific statutory responsibilities under the Local Government Act, Community Charter, and other laws. At the same time, local governments also see the advantages of employing performance-based approaches to deliver their mandates. With their attention on outcomes, the regionally-focused S&C collaborations can work effectively with local governments that may be seeking expertise to support planning fro management of ecological assets in the broader land use context. Nonetheless, a number of local governments engage in performance-based, creative strategies to manage use and conservation of land. The City of Victoria accessed internal leadership to encourage the Dockside Green project and reach a planning and management process that served both the developer interests and those of the city. The City of Langford has taken a performance-based path with several development areas. The District of Maple Ridge engaged in a “Smart Growth on the Ground” planning charrette program to achieve a community-supported plan for redevelopment of the urban core. The plan contains a number of performance-based criteria. Inevitably, any performance-based negotiation will differ considerably from what has been the usual development review process. Risk increases because the number of actors tends to be greater; outcomes have to be mutually defined; all parties need to access expertise to support their case in the negotiations. And, some subject matter may be unfamiliar to one or more of the actors involved. Rewards increase as well. The Province of BC has espoused a “green cities” agenda, including the "Climate Change Action Charter" which requires local governments to commit to plans to reduce the carbon footprint of operations. In response to these and other indicators, cities and towns want to accommodate green buildings – including LEED certified; they value “design with nature” strategies and local/urban agriculture projects now capture their attention. Increasingly, local governments in particular welcome joint ventures where S&C organizations may be cooperating agents to help carry out research, provide public and professional education, and work on new or revised policy concerning protection of the ecology. The regional collaborations in particular have considerable ability to enable and support performance-based strategies in the local government context of managing development and conservation of land. Certainly this is a trend that merits support. There are several examples of effective joint-venture strategies employed by regional stewardship and conservation partnerships. The South Okanagan Similkameen Conservation Program, which has 50 partners, is a collaborator with six local governments to enhance planning services concerning the regions ecological values. Three of the government partners contribute to the funding that provides a shared “environmental” planner and supports a roundtable for implementation of performance-based strategies. In the Comox Valley on Vancouver Island, the Comox Valley Land Trust (CVLT) and its partners in the sustainability Centre have researched and published the report Nature Without Borders. The quality of the research supporting the report’s recommendations has enabled the CVLT to act in an expert capacity in the Regional Growth Strategy (RGS) process. Presently, the local governments in the Valley are pursing a joint implementation strategy concerning the RGS. The CVT is a collaborator in this process as well. As a final example, Wildsight based in the East Kootenay region (reported in Kingfisher Vol. 19), offers a five-year success story in the “Healthy Lake Windermere” Project. This venture includes science and development of methodology to support community stewardship of this important recreation lake in the Columbia Valley. Other regions now use the Lake Windermere model to engage stewardship practices concerning lakes providing key ecological and recreational values. These critical partnerships demonstrate the need for collaboration between local governments, use of performance-based approaches in planning for management of the built environment and protection of the natural areas with their ecological goods and service. They provide an effective fit with local and regional government needs in the context of community and regional planning. ©Real Estate Foundation of BC / 2010. We encourage the reproduction of articles on this website non-profit educational purposes. Please notify the Foundation and the author of all reproductions, including in-house uses.